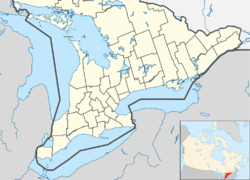 Cobourg (/'koːbə˞g/) is a town in the Canadian province of Ontario, located in Southern Ontario 95 kilometres (59 mi) east of Toronto and 62 kilometres (39 mi) east of Oshawa. It is the largest town in and seat of Northumberland County. Its nearest neighbour is Port Hope, 7 km (4 mi) to the west. It is located along Highway 401 (exits 472 and 474) and the former Highway 2 (now Northumberland County Road 2). To the south, Cobourg borders Lake Ontario. To the north, east and west, it is surrounded by Hamilton Township. The settlements that make up today's Cobourg were founded by United Empire Loyalists in 1798. Some of the founding fathers and early settlers were Eliud Nickerson, Joseph Ash, Zacheus Burnham and Asa Allworth Burnham. The Town was originally a group of smaller villages such as Amherst and Hardscrabble, which were later named Hamilton. In 1808 it became the district town for the Newcastle District. It was renamed Cobourg in 1818, in recognition of the marriage of Princess Charlotte Augusta of Wales to Prince Leopold of Saxe-Coburg-Saalfeld (later Saxe-Coburg and Gotha, who would later become King of Belgium). By the 1830s Cobourg had become a regional centre, much due to its fine harbour on Lake Ontario. In 1835 the Upper Canada Academy was established in Cobourg by Egerton Ryerson and the Wesleyan Conference of Bishops. On 1 July 1837, Cobourg was officially incorporated as a town. In 1841 the Upper Canada Academy's name was changed to Victoria College. In 1842 Victoria College was granted powers to confer degrees. Victoria College remained in Cobourg until 1892, when it was moved to Toronto and federated with the University of Toronto. In 1842, John Strachan founded the Diocesan Theological Institute in Cobourg, an Anglican seminary that became integrated into the University of Trinity College in Toronto in 1852. The timber and other resources of Cobourg's large hinterland were identified as the key to its prosperity, and if they could be brought to the harbour, Lake Ontario opened up a large and prosperous market. Peterborough to the north, founded in 1825 by Peter Robinson, had become the principal source area, and in the 1830s it was still the waterways that were the prime method of bulk transport. Rice Lake and the Otonabee River were brought into use when James Gray Bethune established a steamer running across the lake and up the Otonabee which was navigable through to Peterborough. This meant goods and passengers could be brought at least to the south shore of Lake Rice. The remaining 8 miles of rough tracks was viable for passengers and light goods, but no use for the valuable timber and mine products. By 1835, only 10 years after the first steam railway in the world, there was active discussion about building a railway up to what later became Harwood. However, the townspeople invested instead in a plank road, using 300,000 feet of 3-inch wooden planks, allowing horse-drawn vehicles to haul heavy goods. By 1850 the plank road was breaking up, and was impassible in wet conditions, so the railway scheme was revived. By 1852 there was considerable enthusiasm for the railway project within the town. Unfortunately river traffic had become seen as yesterday's solution by this time, so the plans were expanded to include a 4 kilometres (2.5 mi) long bridge across Rice Lake, to take the railway right up to Peterborough. By 1854 the rails reached the shore of the lake, and it found good work transporting passengers and nearly 2 million feet of lumber from the Rice Lake down to Cobourg that summer. However, all the revenue had to ploughed into building an ill-fated bridge, using hundreds of wooden trestles, 31 Burr Truss spans, and a centre-pivot swing bridge to allow boats to pass. The prime mover locally for getting the Railway company off the ground was D'Arcy E. Boulton, a lawyer based in Cobourg, who enthused the town with the plan. They agreed to begin funding the scheme that was initially expected to cost £150,000, but ended leaving many people with worthless railway bonds and the town council with a debt that was only finally repaid in the 1930s. The man appointed to manage the project was Samuel Zimmerman, who had previously been instrumental in building the Great Western Railway (Ontario). The bridge was constructed over the summer of 1854 and was officially opened on 29 December that year. Three days later it collapsed when ice movements shifted the trestles out of line, splintering the Burr Truss sections. The proposed solution was to stabilise the trestles (or 'stilts' as their critics dubbed them) by an infill of soil, which did happen on the southern side, still visible as a strip of land still remaining running into the lake near Harwood. But funds were not forthcoming for the northern side, and winter ice and shifting lake mud meant that it was frequently unusable. A further problem emerged when Port Hope, not far along the coast, pursued its own plans for a Railway to Peterborough. In 1857 the Port Hope and Lindsay line was constructed, and the following year opened a branch to Peterborough, going round the western end of the lake, in direct competition with the struggling Cobourg route. The response of the Cobourg directors was to oust D.E. Boulton, who then invested in the Port Hope line. Conflicts of interest among various personnel resulted in deliberately removing the bolts on sections of the bridge in early 1861, ensuring that the ice again the bridge was destroyed, and this time it was left unrepaired. The railway reverted to linking Cobourg harbour with Harwood and the Rice Lake water traffic. In 1865 the railway was bought by a consortium of Pittsburgh steel manufacturers, who had already bought the Marmora Iron quarries north-east of Rice Lake, who set up an iron-ore supply route in barges up the Trent River and across Rice Lake to the railway at Harwood. From there it was brought along the Railway to Cobourg Harbour, for shipment across Lake Ontario to feed the steel mills of America. This provided a steady income for the railway and the town until the ore ran out in 1878. It also had two longer term spin-offs in the form of a rail car company and the beginnings of a tourist industry. When the iron ore scheme was getting underway, a small iron foundry based in Cobourg, was approached to cast the wheels and frames of wagons to move the Marmora iron ore down to the harbour. James Crossen saw an opportunity to combine his cast-iron products with the abundant local timber to produce railway rolling stock. With the foundry located near both the Cobourg line and train station of the Grand Trunk Railway, which had been built along the shore of Lake Ontario in 1856, it was well placed to expand as Canada's railway network grew. It was later named the Crossen Car Manufacturing Company and went on to become the largest builder of timber-framed rail cars in Canada, making everything from coal and freight wagons through to dining cars and first-class carriages. By 1910 wood was going out of date, when all-steel cars took over, and in 1915 the company, unable to adapt, went into liquidation, and parts of the site reverted to being an iron foundry. A replica of one of the Crossen ore cars was built in 2016 and is on display near Cobourg waterfront. The connections and trade links which developed through the iron shipments brought many American industrialists to Cobourg, which became a popular summer destination. High class hotels were established, followed in the late 19th century and early 20th century by enormous summer homes for wealthy Americans, a few of which still stand today. One notable home, on King Street East, became the Brookside School - now a youth detention centre. A major ferry service connected Cobourg and Rochester, New York from 1907 to 1952, transporting passengers and cargo across Lake Ontario, allowing Americans to reach the town more readily. For a brief moment in 1856 the town, with both its new railway link to the interior and an east-west rail connection along the Grand Trunk Railway, was feeling secure in its future prosperity, and thought a new Town Hall would encourage further investment and be an asset to the area. Victoria Hall stands at the heart of the downtown, a building that now serves as the town hall, as well as home of the Art Gallery of Northumberland, the Cobourg Concert Hall, and an Old Bailey-style courtroom that is now used as the Council chamber. Victoria Hall was designed by architect Kivas Tully. The landmark is known for its impressive stone work. Charles Thomas Thomas (1820-1867), an English-born master stonecarver and building contractor, executed the fine stone carvings, including the bearded faced keystone over the main entrance into the building. Victoria Hall was officially opened in 1860 by the Prince of Wales, later to become King Edward VII. At that time, Cobourg was a significant town in the Province of Canada, and some townspeople felt that Cobourg would be a suitable capital for the newly united provinces; this privilege went to Ottawa, Ontario, however. One of the oldest buildings in the town was for many years known as The Barracks, suggesting military connections. However it is equally likely that it was built for industrial uses, either in the very early 1800s or as a malting house and brewery by James Calcutt in the early 1830s. It probably served that purpose until a larger brewery was built by the McKechnies in 1863. The old stone-built building had a variety of industrial and storage purposes, and twenty different owners. In 2000 it was acquired in a run-down state by the Cobourg Museum Foundation, who have restored it and it is now open as the Sifton-Cook Heritage Centre. On 20 December 1951, Cobourg experienced media attention as a chartered Curtiss C-46 Commando airplane, bound for Newark, New Jersey, made an emergency landing in local farmer Charles Wilson's field, alongside Highway 2 and Roger's Road. The pilot had lost his way after losing radio contact, and unwittingly drifted north. The 44 passengers and three crew escaped unhurt, but extremely cold in the sub-zero temperatures. The plane, having crash landed on deep snow, was able to be repaired and the field smoothed out enough for it to get airborne again. Cobourg was the site of No. 26 Ordnance Depot, later Canadian Forces Station Cobourg, from 1953 to 1971. Throughout the late 1980s and early 1990s, the town invested heavily in purchasing property along the waterfront and beautifying the area. A boardwalk was developed to connect the harbour and large sandy beach while further pathways were created to encompass Victoria Park and the historic downtown. Because of this renewal and revitalization, many community activities now revolve in and around these spaces. Highway 401 and Northumberland County Road 2 (formerly Highway 2) pass through town. County Road 45 (formerly Highway 45) begins in Cobourg and heads north-east to Norwood. The Canadian Pacific and Canadian National main railway lines (Toronto – Ottawa/Montreal) traverse the town. Via Rail offers passenger service to Cobourg railway station with multiple daily departures on the Toronto – Ottawa/Montreal route. Cobourg Transit is a fully accessible community transit system that provides daily bus service to the town. The community transit system ends its runs by 7pm, which can hamper travel for those without other means of transportation. It formerly ran until 9:30pm however the hours were reduced. The Ontario Waterfront Trail passes through Cobourg and cyclists can be found moving through daily during the warmer months. Age distribution in Cobourg according to the 2006 census. Cobourg also has a satellite campus of Fleming College. Cobourg retains its small-town atmosphere, in part due to the downtown and surrounding residential area's status as a Heritage Conservation District. The downtown is a well-preserved example of a traditional small-town main street. Victoria Hall, the town hall completed in 1860, is a National Historic Site of Canada. The oldest building in the town is now open as the Sifton Cook Heritage Centre and operated by the Cobourg Museum Foundation. Cobourg has several parks. The Cobourg Waterfront Festival, held in Victoria Park and the nearby beach and harbour, is an annual arts and crafts event occurring on Canada Day. It began in 1987 as part of the town's sesquicentennial celebrations, and was conceived by the Art Gallery of Northumberland's former Director/Curator Peter Tulumello and former Concert Hall Manager Mark Finnan. Cobourg's oldest annual event, the Cobourg Highland Games, was started in 1963 in Donegan Park by Dave Carr to celebrate the Scottish culture in the area. The event was moved to Victoria Park in 2013, where it continues each June. Northumberland Today, owned by Osprey Media, is a daily newspaper with content contributed from the Cobourg Star and Port Hope Guide. Five radio stations are licensed to Cobourg, providing music, news and local programming to Northumberland County and surrounding areas. Cobourg uses cable 10 to broadcast local events and weather. Apart from that, Cobourg has no local terrestrial television stations; the closest is CHEX-TV in Peterborough, Ontario. Martin Dobkin, first mayor of the City of Mississauga, Ontario and served as Mayor from 1973 to 1976. Sir John Murray, pioneering oceanographer, marine biologist and limnologist. Considered the father of modern oceanography. ^ 1878 Illustrated Historical Atlas of Durham and Northumberland Counties of Ontario. Toronto: H. Belden & Co. 1878. cited in "Historical Facts, 1878: Cobourg". Archived from the original on 3 September 2013. Retrieved 8 October 2007. ^ a b c "2011 Community Profiles". 2011 Canadian Census. Statistics Canada. 5 July 2013. Retrieved 15 March 2012. ^ Colin Caldwell (October 2002). "Cobourg Peterborough Railway, part 3 Opening Rice Lake". Cobourg History. Retrieved 13 March 2018. ^ Colin Caldwell (October 2002). "Cobourg Peterborough Railway, part 5: The Plank Road". Cobourg History. Retrieved 13 March 2018. ^ Colin Caldwell (October 2002). "Cobourg Peterborough Railway, part 8 Building the Bridge". Cobourg History. Retrieved 13 March 2018. ^ Ted Rafuse. "Destiny Derailed: A History of Cobourg's Railroads 1833-1893". Steampower Publishing. Retrieved 14 March 2018. ^ Colin Caldwell (October 2002). "Cobourg Peterborough Railway, part 6 D'Arcy Boulton's Dream". Cobourg History. Retrieved 13 March 2018. ^ Colin Caldwell (October 2002). "Cobourg Peterborough Railway, part 9 The Ice". Cobourg History. Retrieved 13 March 2018. ^ Colin Caldwell (October 2002). "Cobourg Peterborough Railway, part 10 The Yanks are Coming". Cobourg History. Retrieved 13 March 2018. ^ Colin Caldwell (October 2002). "Cobourg Peterborough Railway, part 12, The Marmora Connection". Cobourg History. Retrieved 22 March 2018. ^ Andrew Merrilees. "Cobourg Industries, part 1, Crossen Car Manufacturing". Cobourg History. Retrieved 22 March 2018. ^ "Cobourg Ore Car Replica". Cobourg History. 2016. Retrieved 23 March 2018. ^ Victoria Hall / Cobourg Town Hall. Canadian Register of Historic Places. Retrieved 14 July 2014. ^ a b "Victoria Hall - Cobourg's Town Hall". Cobourg History. Cobourg Internet. Archived from the original on 24 August 2013. Retrieved 28 July 2011. ^ Leonard, Jim (December 1989). "Charles Thomas: A Stonemason's Legacy Restored". SSAC Bulletin. Ottawa: Journal of the Society for the Study of Architecture in Canada (SSAC). 14 (3). ^ Catherine Milne. "The Sifton Cook Heritage Centre- An historical review". Cobourg History. Retrieved 28 March 2018. ^ "Cobourg Museum Foundation". Retrieved 28 March 2018. ^ Larry Wilson. "Plane Landing in Cobourg - 1951". Cobourg History. Retrieved 13 March 2018. ^ "2006 Community Profiles". 2006 Canadian Census. Statistics Canada. 30 March 2011. Retrieved 15 March 2012. ^ "2001 Community Profiles". 2001 Canadian Census. Statistics Canada. 17 February 2012. ^ "Orlando Bolivar Willcox". Find A Grave. Retrieved 14 July 2014. Wikimedia Commons has media related to Cobourg, Ontario. "Cobourg" . Encyclopædia Britannica. 6 (11th ed.). 1911. p. 613.